The CIA's museum, located at its headquarters in Langley, VA, is home to more than 28,000 items, including gadgets, weapons and espionage memorabilia. Usually, it's off limits to most non-CIA personnel—but a special arrangement allowed Smithsonian magazine to take a tour and photograph select exhibits. The museum's objects—18,000 of which have been catalogued, with hundreds on display—date from before World War II to the present. "Every day, CIA officers help to shape the course of world events," museum director Toni Hiley told Smithsonian. "The CIA has a rich history, and our museum is where we touch that history." The stories behind some of the items are self-evident: a letter from future CIA director Richard Helms to his young son at the end of World War II, written on Adolph Hitler's personal stationary; a rifle modeled on the Kalishnikov AK-47 that was found next to Osama Bin Laden when he was killed by Navy SEALs working under the aegis of the agency. 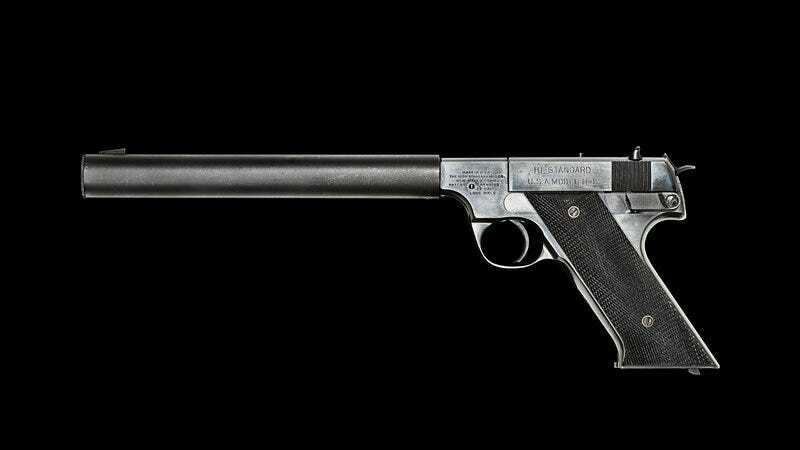 As to be expected at a spy museum, the stories behind other exhibits are more cryptic, such as the Hi-Standard .22-caliber pistol (photo, above) that was "ideal for use in close spaces or for eliminating sentries." Developed by Stanley P. Lovell, the chief of gadgets and weapons for the Office of Strategic Services, the CIA's World War II predecessor, the long-barreled weapon was flashless and silencer-equipped—designed to kill without making a sound. How quiet was it? According to Lovell's account, Maj. Gen. William J. "Wild Bill" Donovan, the chief of the OSS, was so eager to show off his agency's latest lethal gadget that he took a Hi-Standard and a sandbag to the Oval Office. While President Franklin D. Roosevelt was busy dictating to his secretary, Lovell wrote in his book Of Spies and Stratagems, Donovan fired ten rounds into the sandbag. FDR gave no notice and never stopped talking, so Donovan wrapped his handkerchief around the still-hot barrel and presented the weapon to the president, telling him what he had just done. Roosevelt is said to have responded, "Bill, you're the only wild-eyed Republican I'd ever let in here with a weapon." Donovan gave FDR one of the guns, Hiley told me: "It was displayed in Hyde Park. But the OSS came one day and said they'd have to take it back because it was classified." [It was] one of dozens the KGB embedded in the walls of the U.S. embassy in Moscow, and thus a relic of one of the most awkward episodes in the U.S.-Soviet détente. In a purportedly helpful move, the Soviet Union offered to sell the United States precast concrete modules for the building, supposedly to ensure that it would be up to code, and the United States accepted. But mid-construction inspections beginning in 1982, including X-rays, revealed that the Soviets were turning the building into a huge antenna, with some bugs so sophisticated they could transmit each keystroke from the embassy's IBM Selectric typewriters. After that, the top floors of the embassy were torn down and replaced by a secure "top hat" of four floors. The project took more than four years—and was done by American contractors. To see photos of more exhibits, read the article and accompanying online photo gallery at Smithsonian magazine's website.